Share the post "What’s in Season from the Garden State: Jersey Strawberries – The Breed Goes On"
Dr. Gojko Jelenkovic saves seeds from new strawberry cultivars made from crosses in the greenhouse. The season for strawberries in New Jersey is short but sweet – lasting from late May to mid-June. With the year-round abundance of California and Florida strawberries in supermarkets, New Jersey’s strawberry season goes by almost unnoticed, except by aficionados who seek out home grown varieties. While not quite scarce, the commercial production of Jersey strawberries has decreased to the point where New Jersey agricultural statistics are no longer kept for this crop since production fell below 300 acres in 2007. But it wasn’t always this way. New Jersey was once lush with strawberries. Strawberries are native to New Jersey. The original native people, the Lenni Lenape had no need to cultivate the plants, as wild strawberries were abundant. A mix of crushed wild strawberries with ground cornmeal was used for a bread that is considered the inspiration for strawberry shortcake. The first colonists in America shipped the larger wild strawberry plants back to Europe as early as 1600. Wild strawberries were small, acid and seedy compared to the hybrid cultivars that came later but were still considered better than European varieties. According to the book, The Strawberry in North America that was published in 1917, the first strawberries marketed in New York City were wild berries picked from Bergen County in New Jersey. Special splint berry baskets with handles were hung from poles and sold throughout the city. Demand quickly outstripped the supply of wild strawberries as the population of the city expanded. As a result, northern New Jersey was first to feel the stimulus of the increasing demand. Around 1820, commercial cultivation of strawberries in New Jersey began with farmers around Hackensack shipping berries by wagon and sailing vessel to the city. Strawberries and cream was a prized dessert and this helped to fuel the demand. In the mid-1800’s, the introduction of refrigerated railroad cars turned New York into a strawberry shipping center while commercial production began to spread to the southern states. New Jersey strawberry production, however, continued to flourish. The acreage under strawberry cultivation in New Jersey increased over the next few years but gradually began to shift to the southern part of the state. In the 1860’s, Burlington County had the most strawberry acreage than any other county in the U.S.
Before 1858, nearly all strawberries on the American market were selections made in Europe from the North American wild strawberry. These were considered large-fruited but small by today’s standards. For the past 200 years, many Americans, including the growers themselves, have tried through repeated crossings to get more productive, more disease-resistant, better-tasting and larger-fruited strawberries. 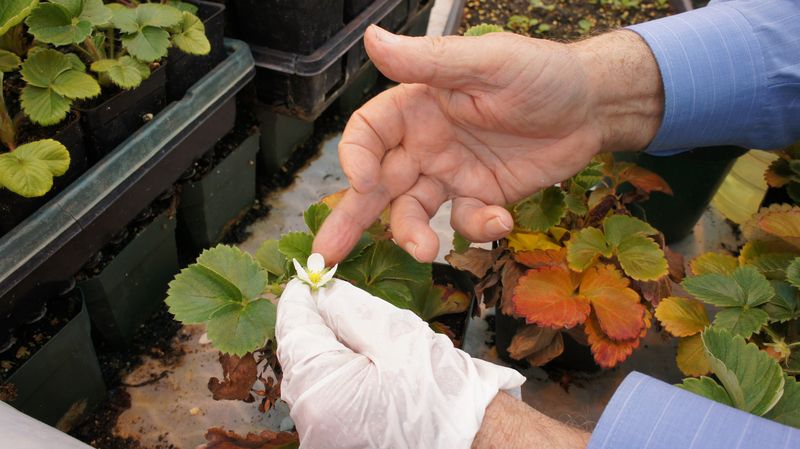 Some of the noteworthy strawberries bred at Rutgers NJAES include ‘Sparkle’ that was introduced in 1942. It continued as a leading late-season cultivar in the U.S. for many decades and is still available today as an heirloom strawberry. Like many old-time cultivars, Sparkle has great flavor and high yields but the size of the berry was considered small compared to newer varieties, hence it was favored by small commercial growers who catered to local tastes. Another important Rutgers variety, ‘Jerseybelle’, was introduced in 1955 and quickly became the leading variety in New Jersey because of its attractive color, high gloss, and large size. In 1963, Jerseybelle constituted 60 percent of the acreage under strawberry cultivation. In 1968, the ‘Raritan’ strawberry was released. It was considered productive with the fine taste of an heirloom strawberry and with small berries. However, the Raritan plants were susceptible to a range of diseases and this strawberry is no longer available. 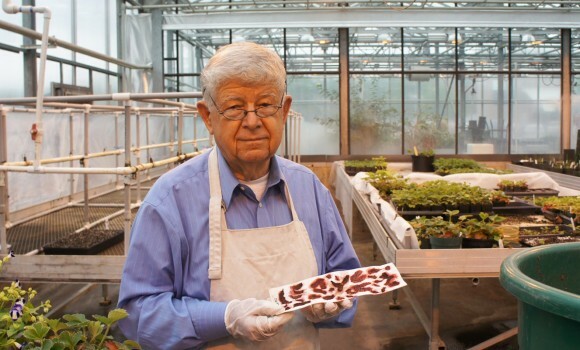 Strawberry breeding from start to finish: Dr. Jelenkovic’s strawberry selections begin in the greenhouse by crossing existing strawberry varieties with desired traits. Pollen is removed by cutting out the male flower parts and crossing with female flower parts of another variety. Now, in the 21st century, strawberry production in New Jersey is a shadow of its former glory. The remaining acreage in strawberry production is mostly planted with Chandler strawberry, a California variety bred for berries firm enough for shipping long distances but not for flavor. The competition from growers in other states that provide a year-round supply of strawberries is a detriment to New Jersey commercial growers. Pete Nitzsche (CC ’87, GSNB ’89), Rutgers NJAES agricultural resource management agent, says, “Wholesale production has declined in New Jersey because of competition from large scale producers in Florida and California. These production areas are able to lock in sales at very low prices with supermarket chains before the New Jersey strawberries get to market.” Nitzsche explains that consumers unknowingly buy shipped-in strawberries at low prices during the New Jersey season and wonder why strawberries don’t taste like they used to. “Reversing this trend presents some real marketing and production challenges,” he adds. In addition to the New Jersey farm trials, the team is working with North Carolina State, The Ohio State University and the University of Maryland to examine the potential of these varieties for the mid-Atlantic region. From these trials, several varieties have shown improved size, shape, color and greater sweetness over Chandler. The names of the new varieties are not yet official and they are in the process of being patented. Following the period of commercial testing, the next step is to work with nurseries to produce germplasm for commercial production. Anticipated release onto the market is around 2015 – 2016. Can New Jersey become lush with strawberries again? Growing varieties that are bred for the specific region can be a boon for local farmers and gardeners. As these new strawberry varieties become available over the next few years, the Jersey strawberry can increase its standing as a local treat to celebrate the season. The best places to find Jersey strawberries are farm markets or farm stands, independent restaurants that use Jersey Fresh as part of their menus and select supermarkets that have special promotions of local produce, such as Wegmans. A great way to enjoy local strawberries is to go to a pick-your-own farm. The New Jersey Department of Agriculture’s Jersey Fresh website has a Pick-Your-Own web page searchable by commodity and location. To see more issues of What’s in Season from the Garden State, go to the Jersey Fresh Information Exchange.